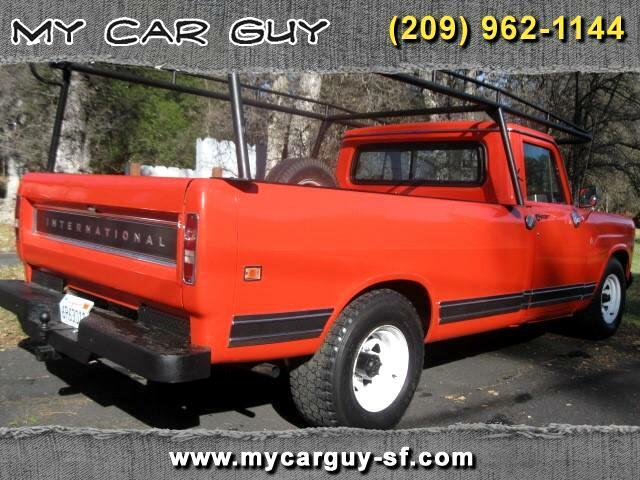 Price slashed to $9,500 on this RARE excellent condition, rust-free and nearly all original California truck. This truck was owned by a woman (wife of a mechanic; 1st owner was her father) in Placerville, CA for most of its life, with a camper mounted on it. The excellent paint is original except for some of the front end after she bumped into a wall. The interior is in great original condition, marred only by a small tear on the driver side. Equipped with air conditioning, it is currently disconnected. The truck was purchased by the woman's friend in 2012: a contractor/mechanic/1960s-70s drag racer, who added a high-quality lumber rack (still in like-new condition). All owners garaged the truck. This IH truck starts up instantly and is powered by a powerful, torquey 392 cu in V8 with an Edlebrock 4-barrel carburetor; it's backed by a 3-speed Borg Warner automatic transmission. The exhaust sounds awesome - certainly not bone stock. This "Camper Special" features dual 16-gallon fuel tanks and heavy duty trailering equipment (including electronic trailer brake controller). After a decade of a design that was becoming quite dated, International’s new Light Line for 1969 was styled competitively with the Big Three from Detroit. Penned by IH Chief of Design Ted Ornas, it was influenced by his first-generation Scout. Subsequently, the new Scout II in 1971 was even closer aligned to the Light Line Truck styling. Featuring a clean shape with minimal body character lines, it still looked fresh decades later. International: Anything less is just a car. That's what International wanted us to believe when they were still building Scouts, Travelalls, and pickups. International Harvester products had a kind of down-to-earth design, probably due to their farm-implement heritage. In fact, almost every IH vehicle was referred to as a "cornbinder." Perfect examples of the same vintage and model IH pickups have in recent years sold in the mid- to high-$20k range; in above average to excellent condition they sell in the high-teens. We offer this collectible, usable, very original, and unmolested workhorse for $9,500. Message: Thought you might be interested in this 1971 International Harvester 1210.